Seibiant Cyf is committed to protecting the privacy of anyone using our website and store and the confidentiality of any information that you provide us with. The purpose of this statement is to set out how we use any personal information that we may obtain from you. Why we need to hold onto your personal data? We may need to contact you if we need to recall a product. We never share or pass your details to anyone else. We like to keep things personal when we contact you. Used to contact you should we need to send you an order confirmation, invoice or credit note. We would never share your email address with other parties. We need to know where to send your order. We also hold your address for future orders so that you do not need to enter it each time you order. If we need to send you a hard copy of your invoice we use this address. We keep a note of what you bought in the past so that you can re order easily. We also keep a note of what you bought so we can contact you to let you know any news about this product that might be relevant to you, including special offers, product recalls, etc. We DO NOT store your bank details. We use a payment gateway called Paypal that handles your bank details on our behalf. If you order by phone, we take your card number at the time, and process the payment immediately, and we never keep your bank details. Where do we hold your information? We hold your information virtually at one location only, which is the Seibiant website. Our website is hosted on a Secure Server. The service is secure password protected. The website www.seibiantcoffi.co.uk involves the use of an SSL certificate — “SSL” stands for secure sockets layer — which creates a secure encrypted connection between the web server where our website is hosted and the web browser where you enter your details when making a purchase. This means your information is secure, safe and protected when being passed from you to us. When you make an order through the website, we copy your address from the order, but we never save it anywhere else. The Seibiant website uses Paypal as our secure payment gateway. We DO NOT get access to your bank details. We do get to see your name and email address and what you ordered on Paypal when you make an order. It’s now a couple of months since I discovered that I’d been accepted onto this year’s Tea Master Course at Obubu Tea Farm in Wazuka, and I’ve now paid for the course, booked my flight, and got my vaccinations sorted. I’ve got excited, terrified, ok about it, now back to terrified again, but I’m sure by the time I’m on that train to Manchester Airport, I’ll be even more terrified! I’m lucky that there are lots of YouTube videos about Obubu Tea Farm, often I think done by the interns who spend several months on the farm. It seems that they choose a project to do towards the end of their stay, and some have chosen to focus on promoting the farm on social media. I’m also very lucky that Ailish who is now working in Seibiant speaks Japanese, and is actually going to Japan before me, to teach English there. 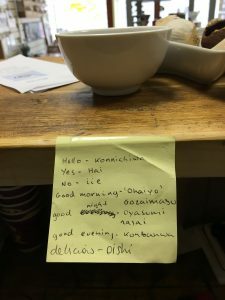 I have a little crib sheet of basic phrases behind the counter in the shop, and it’s surprising how many people know ‘konnichiwa’! Even more exciting is the fact that the Mayor of Himeji in Japan is visiting Conwy in early June, so we’re hoping we can welcome him to the shop, to say Konnichiwa. We were given an extensive reading list to work through before the course, and we have those books in the shop, so if anybody wants to have a look, and maybe borrow them, get in touch – they’re rather heavy – more like the sociology of tea, ethnography, history, and a text book of the Japanese Tea Ceremony – seriously strict and heavy! I didn’t know that there are several schools of thought relating to the tea ceremony, and I think we’ll be getting a taste of each of those while on the course. What I’m most looking forward to however is the tea growing and processing, as I think that’ll be useful for the next step in Seibiant’s progress – but more of that in a future blog. Another big question – me being a notorious light traveller – is the size of bag I take! Do I take a big solid suitcase so that I can bring back teaware and tea, or do I just take my normal size bag, so that I can easily manage it while I’m getting from Osaka to Wazuka! Decisions, decisions!